The Ostriches are divided into two groups, four Drinking Ostriches and four Returning Ostriches. Unlike the Lion or the Scorpion, each star of the Ostriches represents an individual ostrich. The Nest is so named because its stars form a wide arc, which resembles the way that ostriches separate their eggs widely from each other. The Nest is located near the Returning Ostriches, who have already drunk from the river (the Milky Way, where the Drinking Ostriches are) and are now walking away from it to return home to their Nest with its eggs. 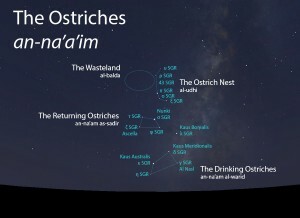 The Wasteland is a region of sky that has no bright stars, located next to the Ostrich Nest, between the Ostriches and the Auspice of the Slaughterer (sa’d adh-dhabih). The Ostriches (an-na’a’im) as they appear setting in the west about 45 minutes before sunrise in late June. Sky simulations made with Stellarium. The Ostriches themselves appear as two groups of four bright stars, each arranged as a quadrilateral, with a ninth star connecting the two groups. The Nest is a grouping of six stars arranged in a wide arc above the Ostriches. The Wasteland is a region of sky devoid of bright stars, located between the Ostriches and the the Auspice of the Slaughterer. The whole group of Ostriches, along with their Nest and the Wasteland, rise within about two weeks but set over the course of almost a month. Today we can expect to observe the Ostriches setting from late June into mid-July and rising in mid to late January, as seen from the latitude of Tucson. The Ostriches do not figure in the calendar of the rains stars. 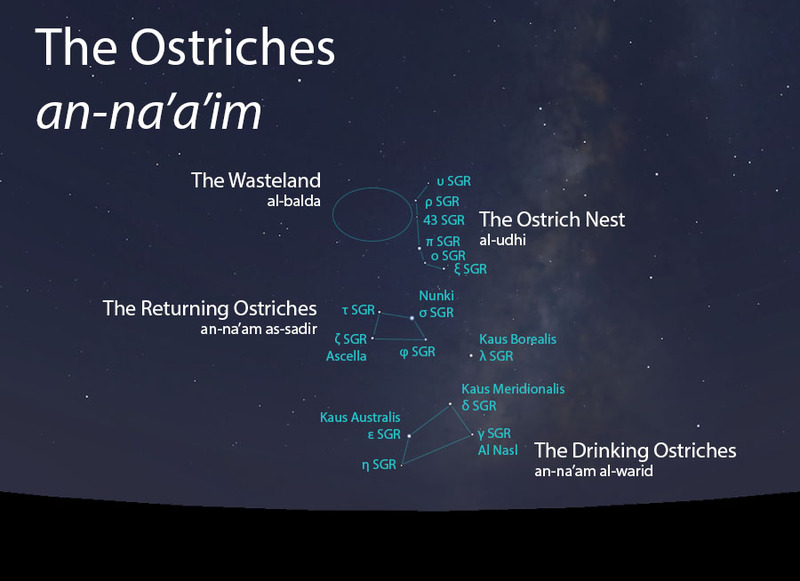 In early listings of the lunar stations, the Ostriches are the 22nd station of the year. This was later changed to the 20th lunar station after the stations were adjusted to begin with the vernal equinox. Two stars from each of the two groups of Ostriches match the Hindu nakshatras called Purva Ashadha and Uttara Ashadha.